Graduate students Brian Toby and Simon Davies formed the Caltech Folk Music Society as a Caltech student organization in 1983. 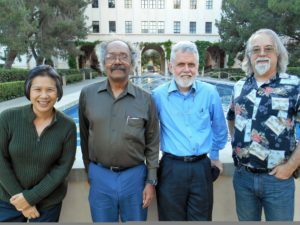 The intent was to bring well-known performers of acoustic music from around the country, and around the world, to play at Caltech for a reasonable price. Long before playing “unplugged” became fashionable, the CFMS began to seek out a wide range of singer-songwriters, bluegrass bands, British Isles music, blues, Nueva Cancion, guitarists, and a whole array of other musicians that did not fit well into mainstream musical categories. While some of these performers emphasize elements of “folk tradition,” others are boldly innovative and truly unique. Social activism, humor, and compassion are commonly present as well. In 2013 (when we turned 30! 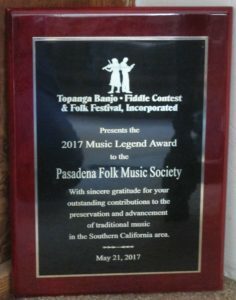 ), the Society became a 501(c)(3) organization and the name was changed to the Pasadena Folk Music Society. Concerts continue to be held at Caltech in Beckman Institute Auditorium [map]. The street address for Beckman Institute is 400 South Wilson Avenue, Pasadena. The Caltech Folk Music Society is a 501(c)(3) non-profit organization with all money collected going toward paying performers, and for mailings and other expenses. If you are interested in becoming a volunteer, please contact to find out more. To confirm dates and times, contact Rex Mayreis or Nick Smith. See all of Topanga Banjo-Fiddle Contest’s Musical Legends here.